We LOVE to dine outside. As a boy Keith grew up with that gorgeous Colorado weather full of fabulous sunshine which made outside meals a dream. Virginia has a more inconsistent weather pattern. Summer at supper time can be down right too hot. Even in the shade our evenings can be stifling. Be that as it may we take advantage of every near perfect day we can get. While I love to eat supper outside Keith loves to eat ANY meal outside. He considers it a perfect day when all three of our family meals are eaten on the patio. Who can disagree with that? As the warmer weather settles in I try to find easy to prepare meals that can be eaten inside or outside. Far too often we tire of the 'ol standard outside American burgers and dogs suppers. Those meals are easy but they seem too informal too picnic-ish. And really I can only stand to eat that so many weekends before I'm completely bored of seeing that meal grace our table. Usually by week's end we have an assortment of leftovers needed to be consumed. Not quite enough of everything to make a repeat meal. Thus is the conundrum of a busy weekend. Rather than spend more time in the kitchen than need be I decided I had to solve our problems. I want to make a lovely meal for the family to enjoy but I don't want to spend a ton of time in the kitchen. Plus being frugal all that leftover food haunts my by Sunday afternoons. This is where inspiration from well fed Europeans comes to mind. 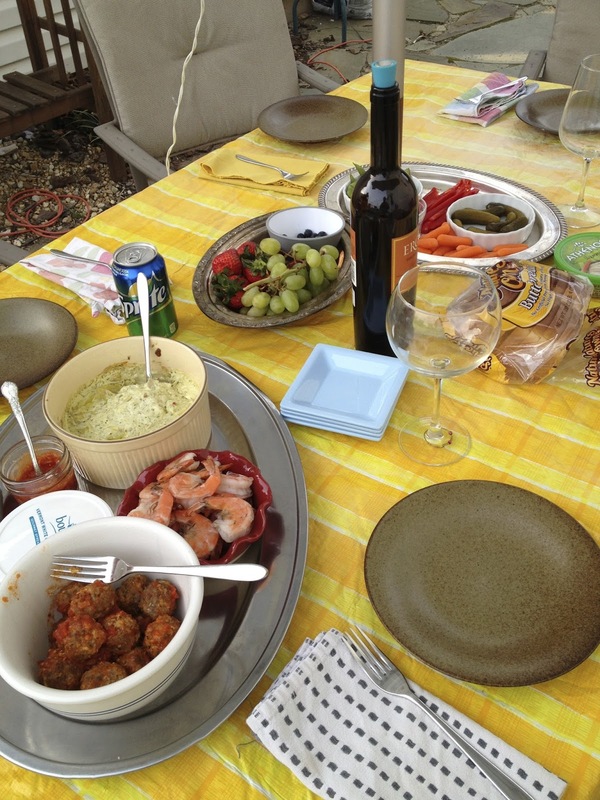 Making a meal out of a variety of finger foods is just the solution to our alfresco goals. Some people call it tapas night, or meze, or antipasto, or appetizers. Small plates. Whatever you want to call it we love this for supper. I enjoy the combination of warm and cold food. Inspired by Spanish, Greek, and Italian influences we can come up with a fantastic variety of food. I took a picture of one of our tapas nights. I warmed up our leftover meatballs, cooked half a pound of shrimp from our freezer, made a quick warm artichoke dip, sliced up some cucumbers, bell peppers, and celery, then I added some pickles, olives, and fresh fruit. A little hummus on the side to go with the tortilla chips some bread with butter for the toddler and we were set. Everyone ate their fill with no need to rush. By having the options presented on the table the kids were slow to pile food on their plates. We all ate little by little until we were full. This style of meal seemed to last longer than others we have on the weekend. We may make this a new tradition. I'll keep calling it tapas night because that sounds so much more exciting than "clean out the fridge" night.